​With all the wear and tear of the changing seasons and of daily usage, your exterior doors need regular maintenance and repair. Not only do routine door repairs help you maintain your home's curb appeal, they can also save you money in the long run. Each type of door will require a different type of repair. While some door repairs are simple, such as replacing hardware, others are more involved, such as a full screen replacement. 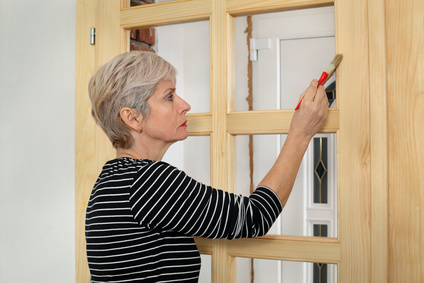 Read on to learn more about door repairs for the home. Common materials for entry doors include wood, steel, and fiberglass. No matter what type of material your entry doors are made of, they will likely need repairs at some point. Wood doors tend to need the most repairs and maintenance. High levels of moisture can cause your door to rot, and sunlight exposure can result in the finish on your wood front doors fading. Luckily, this can be fixed with a quick touch-up. Steel doors, while strong, can be susceptible to dents. These can be fixed fairly easily be removing the original paint, applying filler, and sanding over the area. While mostly low-maintenance, fiberglass entry doors can also develop cracks as time goes on. However, cleaning and patching the crack, followed by painting and buffing the area, makes this repair an easy fix. No matter what material your door is made from, keep an eye out for any areas around your entry door where air is leaking. This can cause a drafty house and increase your energy bills. Simply applying caulk around any leaking areas and adding weatherstripping will reduce outside air creeping into your home. It is generally recommended to inspect the entire entry door area once every one to three years to check if any repairs are needed to the hardware or to the door itself. A screen door is a great way to enjoy ventilation while keeping insects out of your home. However, external factors and general wear and tear can make door repairs necessary after several years of use. The most common repair for screen doors occurs when the screen's mesh wears down. While a smaller hole can be patched up fairly simply, severe damage will require a complete screen replacement. Periodically inspecting the mesh and frame can help you catch any problems early, which will save you money on a full screen replacement. Storm doors are a great option for protecting your home against harsh weather. Thankfully, most storm door repairs are fairly simple. After an extended period of use, the closing mechanism tends to wear down. This is a fairly easy fix, requiring you to simply replace this piece of hardware. Additionally, installing a wind chain can help prevent the need for further storm door repairs. Keeping every part of your home functional and aesthetically pleasing is an important part of being a homeowner. Whatever type of door you have in your home, everything from general everyday use to severe weather make periodical door repairs necessary. If you keep up on the proper repairs, you can save money in the longterm on door replacement costs and add several years to your doors' lifespans.